When viewing some films you find yourself asking whether you are missing something which everyone else appears to get: or is it simply that you fail to follow the crowd and be swayed by popular opinion? One film which raises this question is Interstellar, the space opera by Hollywood wunderkind Christopher Nolan, the director who’s touch – in populist, box-office terms – turns everything to gold. Never a filmmaker to do things by half measure, Nolan appears to believe that he is one of the few filmmakers who can can do everything – write, produce and direct: his epics – which audiences and critics alike either love or hate – make your average blockbuster look puny in comparison. More often than not however, scratch beneath the glossy veneer of his monolithic productions, and the core is dull and lacklustre. Interstellar is one such film. Cooper (Matthew McConaughey) used to be involved in space exploration. But that was before the death of his wife. Now all he wants is to look after his kids and farm his land in the wild, open spaces of rural Texas. That is until he is called upon by a secretive NASA department – headed by a Professor Brand (Michael Caine) – to explore whether the future of mankind lies beyond the furthest reaches of the known universe. So, with a crew including Brand’s daughter Amelia (Anne Hathaway) Cooper sets off to go, quite literally, where no man has gone before. There are two kinds of space / sci-fi film – those such as Apollo 13 (1995), which approach the subject from a serious angle, or ones in the Star Trek and Star Wars mould which happily admit that their subject matter is never likely to happen and hence treat the whole thing as a bit of fun. Occasionally you get a film like Stanley Kubrick’s masterpiece 2001: A Space Odyssey (1968) which successfully combines both elements, but these are usually significant by their scarcity. Following the success of last year’s far superior – and ‘serious’ – Gravity (2013) it was inevitable that other filmmakers would follow suit, in an attempt to emulate its success. However, where Alfonso Cuarón’s film combined a story gripping enough to hold your interest yet not detract from the real star – i.e. the effects – with award worthy acting from George Clooney and Sandra Bullock, Nolan’s bloated fantasy fails by trying too hard. 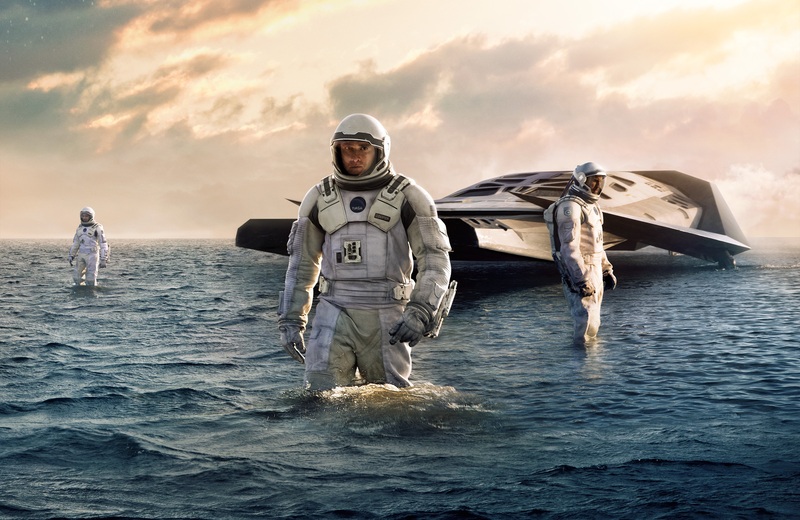 With Interstellar he has attempted to emulate the essence of Kubrick – fusing moral issues, evolution, the future survival of mankind, and even a smattering of alien interference – with the straightforward reality of space exploration as seen in Gravity. By half way through the two hour, forty nine minute running time however, so many strands – political conspiracies, interfamily relationships and space / time travel (involving a particularly convoluted and confusing theory) – have been introduced, that the viewer will most likely have lost not only their way, but also their interest in the proceedings. In the film’s favour it looks stunning: for this reason alone, if you are going to see it you should do so on the big screen. From the dusty plains of Texas where the film opens, to furtherest reaches of space, the film has an all encompassing sense of vastness: the scenes where the ship carrying Cooper and his crew pass through the outer rings of various planets light years from our own, are admittedly awe inspiring and worth seeing super-scale. Unfortunately these moments last for a comparative fraction of the film’s overall running time, and in no way justify an otherwise overblown production. McConaughey and Hathaway – along with Jessica Chastain as McConaughey’s scientist sister Murph – put in performances which, though perfectly adequate in context, are unlikely to move your world. As for the once great Michael Caine – he now seems to be marking time as he shuffles from scene to scene in an attempt to keep up with his more agile colleagues. Suffice to say – without wishing to spoil the film for those who plan to see it – Interstellar is as fathomless as the darkest reaches of space which Nolan tries, unsuccessfully, to explore.